Our new writer John reviews the graphic novel to film translation of I Kill Giants. Your early teens are often a time of great confusion and angst. I Kill Giants clearly represents that through menacing giant creatures, and Elder Scroll style potions, yet as mythical as it all sounds the film doesn't stray far from the gorgeous seaside town it takes place in. Set in an unnamed gloomy New England town, I Kill Giants (directed by 2014 Oscar winner for best short film Anders Walter) is a different coming of age film. Based on the critically acclaimed graphic novels of the same name, the film does a great job in not straying far from some of the scenes in the original source material. Starting off slow at first, the film's scenery and cinematography are enough to draw you in. The grey pebble beaches and the dark forests of the coast are where we first meet young Barbara (Madison Wolfe) who with her mismatched clothing and her adorable bunny ears, packs enough no-nonsense sass into one little girl that it won't leave you wondering why she stars in a film where killing giants is literally in the title. I'm 'bout to mess up some giants, y'all! Barbara lives with her hardworking sister Karen, played by Imogen Poots, who spends her time between her work and home, and her video game loving brothers. Spending time honing her dungeon and dragon skills, Baraba deals with all things typical of your middle school coming-of-age movie including bullies and other middle school antics, during which we meet a young girl named Sophia (Sydney Wade), whose quiet English posh mixes well with Barbara's abrasive outgoing nature. Ditching her Guardians of the Galaxy garb for a quiet job at a school, Zoe Saldana — perhaps the biggest name in the film— plays the character of Mrs, Molle, and is a familiar face in a film where you may not recognize any of the actors. 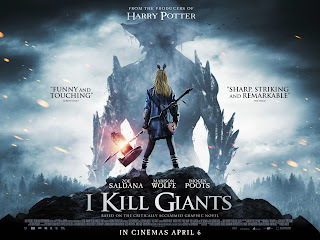 While entertaining, I Kill Giants is confusing at times, and somewhat hard to follow as some scenes involve characters talking while a different character is on screen, which can get confusing but is not enough to ruin the overall film. In the end, the movie is about overcoming personal struggles within oneself. Madison Wolfe steals the show during every scene she's in while portraying this. For anyone overcoming their own personal demons, I Kill Giants is an entertaining and relatable piece that I would recommend to anyone. Given its atmosphere and feel, The film's overall setting makes it best enjoyed on a rainy day.